← Let the $10 Billion Rumpus Begin! Mumia Abu-Jamal is the Great American Rorschach Test. Cop killer? Or political prisoner? HARRISBURG, Pa. >> A federal judge Tuesday threw out a Pennsylvania law designed to prevent offenders from causing mental anguish to crime victims, calling it an illegal restriction on the right to free expression. U.S. District Judge Christopher Conner ruled against the law that was enacted quickly late last year after Mumia Abu-Jamal gave a recorded commencement address to a small Vermont college. 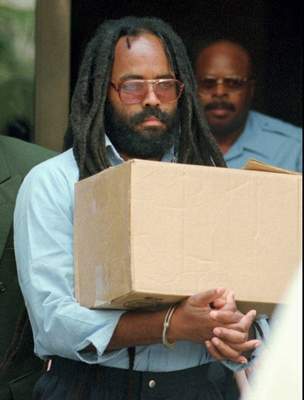 Abu-Jamal is serving life for the 1981 killing of Officer Daniel Faulkner in Philadelphia. Coincidentally (or not), this ad ran in yesterday’s New York Times. 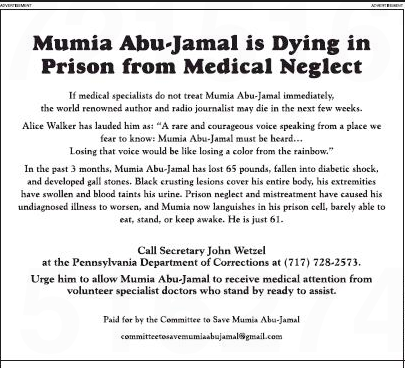 So, the Committee to Save Mumia Abu-Jamal has spoken. We’ll be interested to see if he follows suit. This entry was posted in Uncategorized and tagged Committee to Fry Mumia Abu-Jamal, Committee to Save Mumia Abu-Jamal, cop killer, Daniel Faulkner, Deleware County Daily Times, Great American Racial Rorschach Test, John Wetzel, Mumia Abu-Jamal, New York Times, Pennsylvania Department of Corrections, political prisoner, U.S. District Judge Christopher Conner. Bookmark the permalink. “A past criminal offense does not extinguish the offender’s constitutional right to free expression.” But in many jurisdictions, it removes the offender’s right to vote. Isn’t this the quintessential “free expression”? No. It makes the point that voting is a right of citizenship and not one of automatic Constitutional imperative.